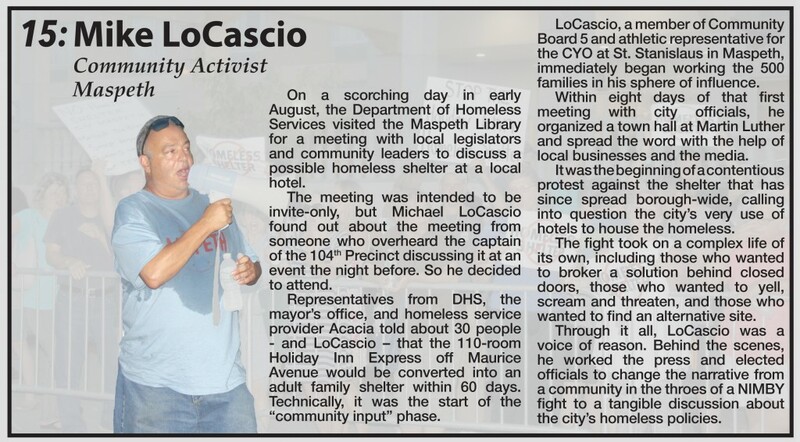 On a scorching day in early August, the Department of Homeless Services visited the Maspeth Library for a meeting with local legislators and community leaders to discuss a possible homeless shelter at a local hotel. The meeting was intended to be invite-only, but Michael LoCascio found out about the meeting from someone who overheard the captain of the 104th Precinct discussing it at an event the night before. So he decided to attend. Representatives from DHS, the mayor’s office, and homeless service provider Acacia told about 30 people – and LoCascio – that the 110-room Holiday Inn Express off Maurice Avenue would be converted into an adult family shelter within 60 days. Technically, it was the start of the “community input” phase. LoCascio, a member of Community Board 5 and athletic representative for the CYO at St. Stanislaus in Maspeth, immediately began working the 500 families in his sphere of influence. Within eight days of that first meeting with city officials, he organized a town hall at Martin Luther and spread the word with the help of local businesses and the media. It was the beginning of a contentious protest against the shelter that has since spread borough-wide, calling into question the city’s very use of hotels to house the homeless. The fight took on a complex life of its own, including those who wanted to broker a solution behind closed doors, those who wanted to yell, scream and threaten, and those who wanted to find an alternative site. 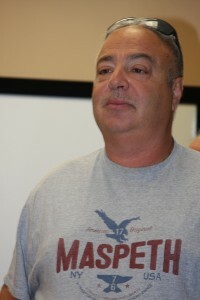 Through it all, LoCascio was a voice of reason. Behind the scenes, he worked the press and elected officials to change the narrative from a community in the throes of a NIMBY fight to a tangible discussion about the city’s homeless policies.